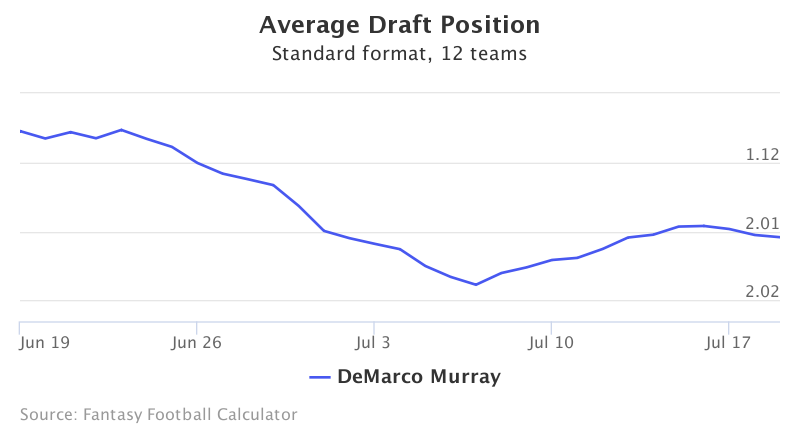 Currently, DeMarco Murray is being drafted at his fantasy ceiling. As you can see below he is being drafted in the early second round or as the RB7. This is typically something I look to avoid, as I always want to maximize a players ceiling and avoid capping it. By doing this we have an easier time generating value in a player and lowering the risk of a bust. Let me explain this a bit further. When drafting a player at his ceiling, you are essentially taking added risk that he doesn’t live up to his cost. If you believe that such players output can only achieve a certain amount of fantasy points, then giving a quick glance at current ADP’s can help determine his ceiling. The reason it’s risky to draft a player at his ceiling, is you have no wiggle room for unforeseeable circumstances. The instance here with Murray is that there is a very obvious situation looming about, and I will dive into this here. The first thing that should worry us when we look at DeMarco’s 2016 splits, is the obvious drop off in fantasy points per game. 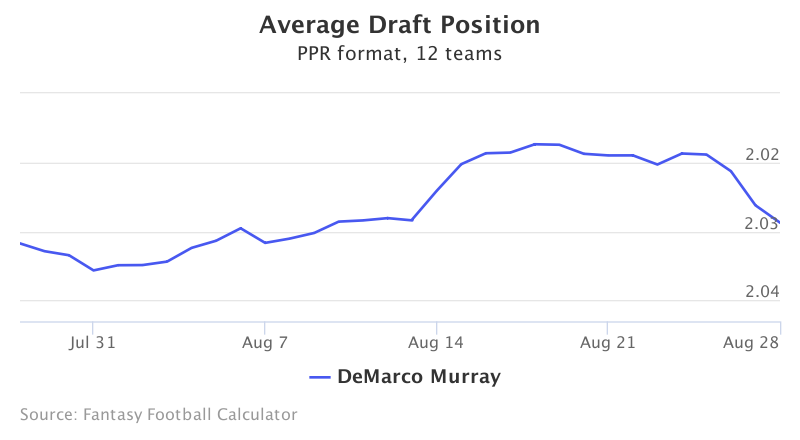 From week 1 to 8 Murray averaged 21.41 FP/G (PPR) and in the remaining eight games Murray’s fantasy production took a big plunge. His average dipped 6.4 points down to 15.01 FP/G (PPR) average. Looking over this it should be clear that he was trending down in the last eight weeks of the season. Not only did his yards-per-carry depress from 4.73 to a 3.99 average, his volume started to dissipate as well. In the first eight weeks, we see that Murray toted the rock an average of 20 times and also caught 3.5 passes per game. Second half his total touches dropped from 23.5 to 19.74, might not look significant but digging a little deeper we can start seeing a clear trend. I went ahead and looked at the weeks where Derrick Henry missed (week 9 & 11) and subtracted Murray’s touches out of this equation. The outcome of this showed Murray’s touches dropped even further down to 18.83 per game. Using the games Henry missed we can go back to the original point of clarity. His fantasy outcome looked even worse at a staggering 13.68 FP/G. This would equate to 218.88 fantasy points for a 16 game stretch. Netting him a ceiling of RB11 in point per reception leagues. Everything listed above is just the start of why you shouldn’t draft DeMarco Murray. I’ve laid out facts that Murray’s ceiling may well be RB11 and that it’s clear he is being over drafted at RB7. You also still have to worry about Murray’s lingering hamstring issue and Derrick Henry lurking in his shadow. These are all reasons I will not be drafting DeMarco Murray in 2017. It&apos;s that time of year. Lying Season. Be careful what you believe as the NFL draft looms, because what you hear is not necessarily rooted in truth. Whether it&apos;s finding a quarterback for the future or picking up an immediate starter, all 32 NFL teams have varying needs for a passer in the draft. Drew Lock and Rashan Gary are among the 2019 NFL draft prospects who have considerable upside but also pose a significant risk to teams. Some NFL teams and fan bases might be thanking the league for their favorable schedules while others wonder what they did wrong. The Cowboys don&apos;t have a first-rounder in the upcoming NFL draft because they used it to acquire WR Amari Cooper. What are the team&apos;s draft plans? The NFL announced its full 2019 regular-season schedule on Wednesday. Take a look at the information you need to know for all 32 teams. NFL mock draft: Which team might trade for Oklahoma&apos;s Kyler Murray if Cardinals pass at No. 1? Trades always shake up the first round of the NFL draft, so USA TODAY Sports projected a few trades that could alter this year&apos;s outlook. NFL draft&apos;s 100 biggest busts: Which picks, trades proved to be whiffs? Cleveland appears on verge of playoff breakthrough after offseason shakeup. Figuring out the NFL&apos;s regular-season schedule entails addressing a litany of complex factors, including stadium availability and broadcasting rules. Ranking all 32 NFL uniforms: How does New York Jets&apos; new look rate? The J-E-T-S revealed their new uniforms Thursday, but do they compare favorably with some of the NFL&apos;s signature looks? See the full preseason schedule for all 32 NFL teams ahead of the forthcoming release of the full regular-season schedule. 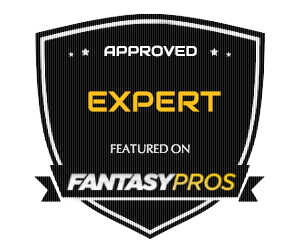 We&apos;ve got team experts across the country who will join us each week to keep you updated on the goings on in the NFL. With Super Bowl LIII in the books, we take a look at where the latest title bout and Patriots win ranks throughout NFL history.